The Washington state Supreme Court has ruled that an initiative that would make it easier to prosecute law-enforcement officers who have allegedly misused deadly force must go on the November election ballot. OLYMPIA — An initiative to make it easier to prosecute law-enforcement officers accused of misusing deadly force will go on the November election ballot, the Washington state Supreme Court ruled Tuesday. 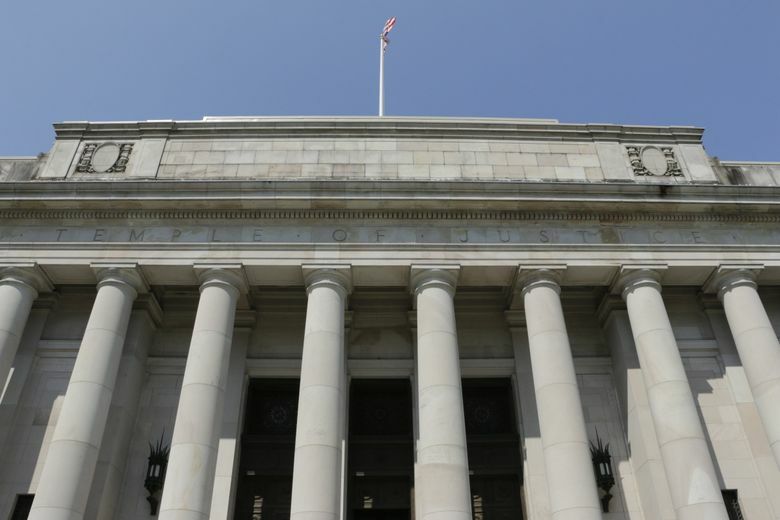 In a sharply-divided opinion, a majority of the justices upheld a Thurston County Superior Court order putting Initiative 940 on the ballot. Like the lower court’s ruling, Tuesday’s decision keeps off the ballot a compromise bill preferred by law enforcement that legislators had passed along with the initiative in a novel maneuver that was quickly challenged in court. Lawmakers passed both measures with the intention that the compromise would replace the initiative — and that neither would go on the November ballot. That prompted a lawsuit by initiative activist Tim Eyman who argued the Legislature’s move was unconstitutional. The latest ruling now sets up a fall election campaign and the likelihood that lawmakers will return to the issue in the 2019 legislative session. Leaders of De-Escalate Washington, which sponsored the initiative but agreed to the compromise bill, vowed to campaign to pass I-940. “I think we’re confident in our ability to win in November,” said Heather Villanueva, manager of the I-940 campaign. The campaign is gearing up to bring back its volunteers, she added, and start fundraising again. A statement Tuesday signed by three law-enforcement groups said they “remain committed” to the compromise legislation. “We are disappointed only I-940 is going to the voters without the critical and necessary improvements” in the compromise bill, said a statement by Washington Association of Sheriffs and Police Chiefs, Washington Council of Police and Sheriffs and the state chapter of the Fraternal Order of Police. The initiative will face opposition by at least one campaign committee, Coalition For A Safer WA. That campaign has, so far, raised about $90,000, with almost all of it coming from the Seattle Police Officers Guild. “We’ve launched a full campaign to defeat 940 at the ballot, and we’re educating voters,” said Mike Solan, a Seattle police officer who is helping to lead the campaign. Sen. Mike Padden, R-Spokane Valley, who joined Eyman’s lawsuit to become one of the plaintiffs in the case, cheered the court decision. He said the Legislature’s unprecedented maneuver could have threatened the initiative process. If the maneuver were found to be lawful, “Lawmakers could block public votes and thwart the people’s will by passing initiatives submitted to the Legislature and then amending them to death,” Padden said in a statement. I-940 spells out changes to a law that is considered the nation’s most restrictive in holding officers legally accountable for negligent shootings. That standard makes it is nearly impossible for prosecutors to bring criminal charges, even when they believe an officer has wrongfully killed someone, according to a 2015 report by The Seattle Times. With initiatives to the Legislature like I-940, lawmakers have three options: Pass the initiative without changing it, take no action and let the initiative go to the November ballot, or propose their own version and let both proposals go to the ballot. Instead, legislators took a fourth path — which was rejected by the court. The Legislature passed a separate bill, HB 3003, that amended I-940. Then lawmakers passed the initiative itself — assuming the changes made in HB 3003 would go into effect. That arrangement, supporters believed, would not require either measure to go to the ballot. HB 3003 was a compromise between De-Escalate Washington and some law-enforcement groups that had opposed previous efforts to change Washington’s deadly-force law. Both HB 3003 and I-940 would change the “good faith” language and provide officers more training to help them avoid deadly confrontations. But some found language in I-940 dealing with deadly force to be unclear and unwieldy. The compromise bill dropped the word “malice” as it applies to use of force and provided a new definition of “good faith” that community advocates and some law-enforcement groups agreed upon. But in April, a Thurston County Superior Court judge ruled the Legislature’s maneuver to amend the initiative violated the state Constitution and ordered I-940 on the ballot. Rep. Roger Goodman, D-Kirkland, chair of the House Public Safety Committee and one of the lawmakers who helped negotiate the compromise, said he believed the deal between law enforcement and De-Escalate Washington would remain in place. Lawmakers could vote again on the compromise legislation when they return to Olympia for the 2019 session in January. They’d need a simple majority to approve the compromise if I-940 fails at the ballot box. But if it passes, lawmakers would need a two-thirds majority vote to amend the initiative. Padden said he worries that if I-940 is approved, enough lawmakers might want to let it stand as written, rather than amend it with the compromise language. Though they affirmed the lower court’s order, the Supreme Court justices remained split on the Legislature’s maneuvering — and the court’s role in dealing with it. In a 70-page ruling, the nine justices produced five different opinions, where they, at times, vehemently disagreed with each other’s reasoning. In writing the lead opinion, Justice Sheryl Gordon McCloud said more than once that she felt I-940 shouldn’t go on the ballot, even if a majority of the court felt otherwise. “1-940 passed; the judiciary lacks the power to treat it as ‘not passed,'” McCloud wrote. A total of four justices, including McCloud, said neither I-940 nor HB 3003 should go on the ballot. In two other opinions, four justices said both measures should go on the ballot. In her own opinion, Justice Mary Yu criticized what she called “simplistic solutions” offered by Madsen and Justice Debra Stephens, who wrote an opinion concluding both measures should be on the ballot. “Contrary to the opinions of Justices Madsen and Stephens, this court does not have the authority to retract a validly enacted law without first declaring it invalid or unconstitutional,” Yu wrote. “I strongly disagree with this inappropriate expansion of judicial power,” added Yu, who believed neither measure should appear on the ballot.